Join San Diego milliner Diana Cavagnaro for a fun morning of mimosas and millinery! You will have the opportunity to craft a one-of-a-kind fascinator, suited to your style, all while enjoying champagne and good company. Join us as we celebrate the close of the Equestricon® General Session with Jukebox the Ghost at Mercury Ballroom in downtown Louisville! Meet the connections behind Team Justify in an autograph signing, meet and greet, and trophy photo opportunity, all benefitting the Permanently Disabled Jockeys Fund. Join other Equestricon® attendees and get ready for 2 days of racing celebration! Free appetizers and discounted drinks offered to Equestricon® passholders and Louisville Marriott Downtown guests at Merle's Whiskey Kitchen, just 2 blocks from the Kentucky International Convention Center! Equestricon's Closing Ceremonies include a Town Hall discussion with leaders of the industry. TVG's Matt Carothers moderates. Ren Carothers opens questions from the audience. Thoroughbred trainers stop by and chat with fans in the Sagamore Social Lounge. Meet the team behind this year's Kentucky Derby winner Always Dreaming in the Equestricon "Winner's Circle". Take a photo with the KY Derby trophy, and the connections behind the horse that won the Run for the Roses! Appearance to benefit the PDJF. Come hang out for a while in the Sagamore Social Lounge, while networking with young racing professionals from all corners of the sport. Based in Saratoga Springs, Parting Glass Racing offers the full ownership experience with shares in quality New York breds. Join us for a meet and greet with Parting Glass principals, staff, and members! Champagne Mimosas, Cheese Platter and Chocolate Covered Strawberries will also be served! Grab a drink and catch up with fellow racing tweeps inside the Sagamore Social Lounge. Musicians perform on the main stage throughout the afternoon. 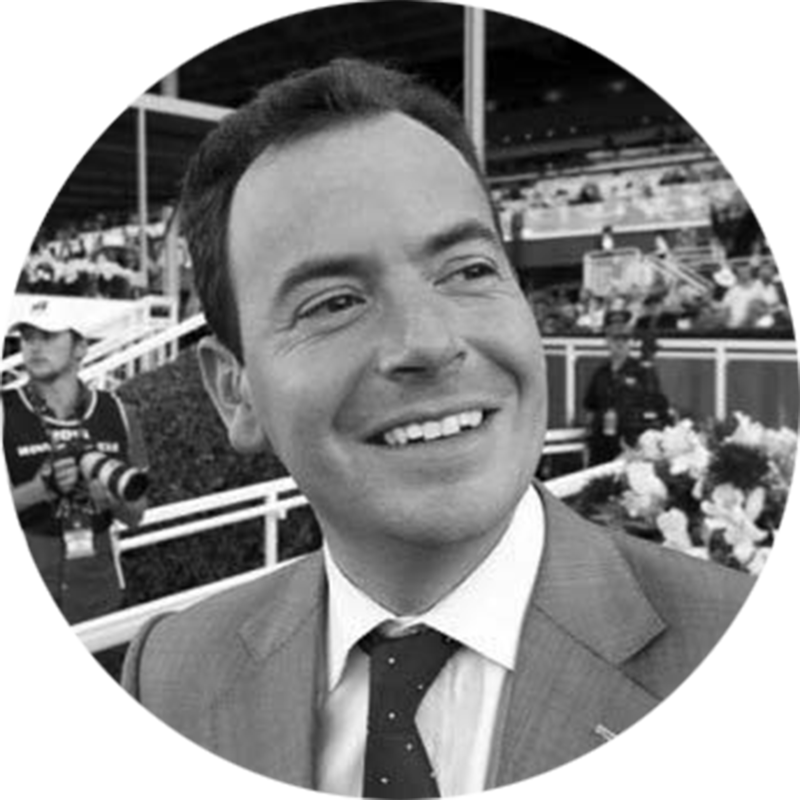 Internationally renowned racing broadcaster Nick Luck delivers Equestricon's Racing Keynote Address. Join Eclipse Award-winning filmmakers Brad and John Hennegan for a tenth anniversary screening of The First Saturday in May. New and well-known racing artists are highlighted in the central bar area. Happy Hour drinks served. Trade stories and shout-outs with your fellow racing ‘grammers inside the Sagamore Social Lounge. Meet the people behind this innovative co-ownership group in Equestricon's Showcase Hub. Hit the Sagamore Social Lounge for a networking session with young racing professionals from all areas of the industry and learn more about how to get involved in racing. Media icon and OTTB owner Soledad O'Brien delivers the "Aftercare Keynote" on the main convention floor of the Saratoga Springs City Center at Equestricon. VIP Passholders, Sponsors, and Distinguished Guests are invited to kick-off the start of Horse Racing's Premier Convention with a live band, silent auction, and delicious appetizers at the beautiful Canfield Casino! VIP Passholders Only. This is your opportunity to sit in on the 65th-Annual Jockey Club Round Table Conference. The conference will focus on vital matters pertaining to the racing industry. The Jockey Club Round Table Conference will be held at the prestigious Gideon Putnam in Saratoga Springs.